$$ | 1139 Lincoln Ave.
$$$ | 219 Healdsburg Ave.
$$ | 2020 Webber St.
$$ | 601 Petrified Forest Rd. $$$ | 2230 Madison St.
$$ | 1314 McKinstry St.
$$ | 800 California Blvd. $ | 1830 Lincoln Ave.
$ | 2777 4th St.
$ | 101 Fountaingrove Pkwy. $ | 21714 Geyserville Ave.
$$ | 112 Matheson St.
$ | 198 Dry Creek Rd. $ | 195 Main St.
$ | 308 Wilson St.
$ | 6523 Washington St.
$$ | 3115 Porter Creek Rd. The fanciest accommodations are concentrated in the Napa Valley towns of Yountville, Rutherford, St. Helena, and Calistoga; Sonoma County's poshest lodgings are in Healdsburg. The spas, amenities, and exclusivity of high-end properties attract travelers with the means and desire for luxury living. 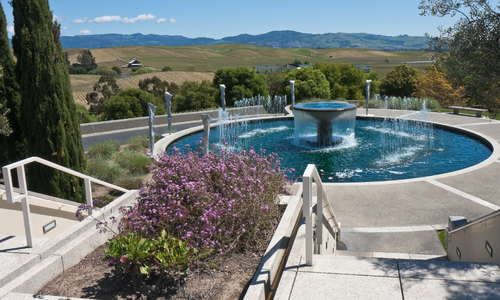 The cities of Napa and Santa Rosa are the best bets for budget hotels and inns.